I concider installing Win 7 Pro 64-bits, so I can use more memory. a. Are applications on W7-64 with 8G noticable faster then XP-32 with 4G? b. Does W7-64 allow a multi boot environment? c. Are there more advantages of Win 7 Pro 64-bits over XP Pro 32-bits? If you use a 32 bit application, it might be a tiny bit faster. that package can be 65% faster when you use 64 bit compilation. 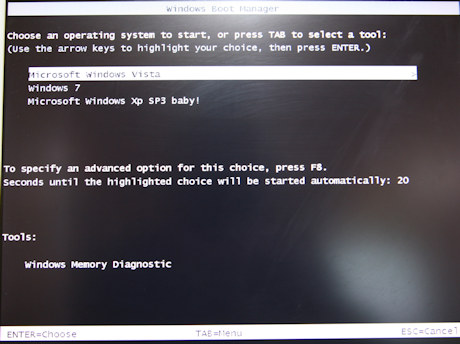 Windows 7 has a boot menu, like the other versions of Windows. available for editing the boot menu. small and there are limitations. And some applications won't run at all. when running them under Win7x64. instead of 3.something which is available under XP 32-bit. (astronomy) software that using x64 is a huge advantage in my work. would benefit from more memory. But this does not happen often. run in 32bit. There are not many 64 bit programmes available. restrained by the 3.3Gb limit of 32bit OS. in 32bit. There are not many 64 bit programmes available. IMHO that is the only advantage af W7 64-bits. The more RAM you have, the less you need to use the paging file. On Fri, 24 Feb 2012 10:12:18 +0100, "Fokke Nauta"
1. It's being 64-bit makes very little difference. a large photograph, yes it could make a big difference. few of those available, but that will change in the future. On Fri, 24 Feb 2012 12:29:29 +0100, "Fokke Nauta"
programs work if you use VMware Workstation. the case is for your hardware. In some cases you might need new peripherals. experience. DOS programs do, as do many written for W2000 and not updated. future. Or even if anything would break at all. DX9. Important if you play games. All of you thanks for your replies.